View inside Taupō Pa, at Plimmerton looking out to sea with part of Mana Island out to sea on the right and the South Island in the distance. 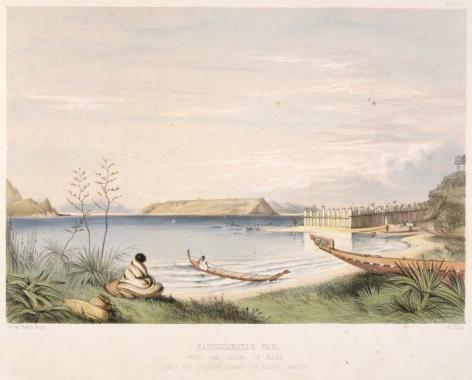 The palisades of the pa run down to the water’s edge on the left, with a raupo whare propped against the fence line. A Maori family (father, mother with a child on her back and a toddler at her side) is walking away from the viewer, and three armed Maori are seated or reclining in the centre foreground, beside a cabbage tree or dracena plant. 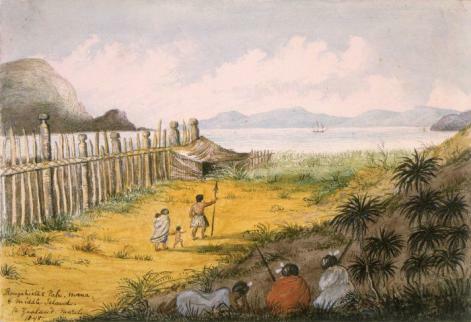 Shows on the rise in the right foreground a wahi tapu, or sacred place serving as a receptacle for goods and property that have become subject to the law of tapu for a certain length of time. The wahi tapu is constructed of sticks and contains household utensils, skins, calabashes and dried fish, and a garment suspended beneath flutters in the wind. In the right distance behind the wahi tapu is the bay “about a mile from Porirua”. 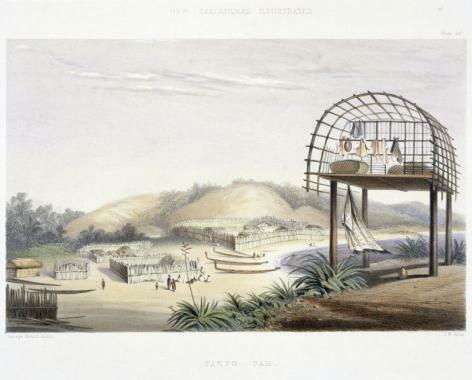 Several canoes are drawn up on the beach, and there are four palisaded enclosures containing whare on the shore. In the centre foreground is a flax bush.